The Christian Value of LOVE underpins all we do and, with the Christian Values of COURAGE, TRUTH and RESPECT supporting our Christian foundation, ensures we have a strong, inclusive community. 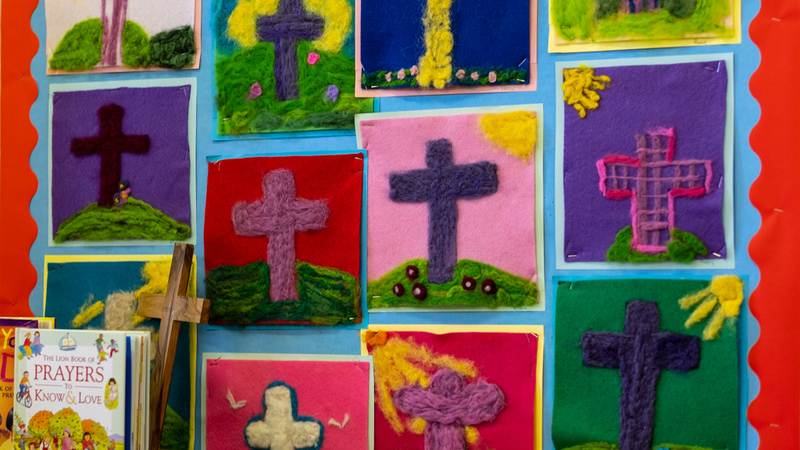 Central to our ethos is the abiding Christian belief that every child should be loved and valued as an individual. Inclusion and acceptance are key principles which enable all children in our school to thrive and reach their potential. We are passionate about developing the ‘whole’ person and work hard with our children to develop skills of perseverance and commitment to both their learning and to their place in our close-knit community. To achieve this we work hard to enable our children, who come from a variety of backgrounds and from a very wide catchment area, to see themselves as one body through our Acts of Collective Worship, our House Team activities and through special days such as Maths Days and special weeks such as Book Week. Our children are actively encouraged to serve others and take on responsibilities within our school community. Children in Years 5 and 6 apply for their “jobs” each September and carry them out to a very high standard. Their roles are real ones and not completing tasks leaves a hole in the school’s operation! The younger children, noting how the older ones have particular jobs and responsibilities within school, aspire to be just like them. Our greatest delight is when children notice a gap in our organisation and offer to fill it! Ours is a peaceful, though happy, lively and busy school. Enthusiasm is evident but conflict is rarely seen. Our Christian ethos, which has the repair of relationships and an understanding of forgiveness at its heart, contributes to this. We manage any upsets using Restorative Justice principles; all of our children are taught about their feelings so there is a high level of emotional literacy, and we educate our older children in conflict management so they can be Playground Peacemakers should the need arise. Forgiveness is key as we value repairing and maintaining relationships and we do not seek to allocate blame. In addition to this, adults in school model Christian Values of Community and Love with the whole school community and our children are witnesses of this on a daily basis. The older children, having grown up within this nurturing environment, naturally care for the younger children. Ours is also a very friendly school. Children and staff joining us always comment on how quickly they feel at home. Relationships between staff and children, and staff and parents or carers are very strong. Visitors frequently comment on the warm atmosphere. The close relationships, continually nurtured, result in trust between members of our school community. We respond positively to acts of compassion but are aware that we must be sensitive to all involved. Our Values Stars offer children opportunities to value each other and those receiving them are always proud to do so. Our pupil feedback demonstrates that our children are happy. The culture of respect and feeling included is strong, so insensitive or irreverent acts are rare. Our children are quick to condemn those who have shown such attitudes, but we always aim to help our children to handle their outrage and discuss calmly why they are upset by such actions. Again, basing how we manage any behaviour issues on Restorative Justice allows us to have meaningful open conversations or circle times to resolve such situations. All children want to be in a situation where everything is fair and there is a strong culture of fairness in school. We support this and extend it to a social concern for the wider world demonstrated through our Eco Club who put on assemblies for us, our charity work throughout the year led by the School Council, and whole school responses to natural disasters, often prompted by individual children. We aim to foster an appreciation of the richness and diversity of God’s creation through lots of practical opportunities to get out and about. Forest Fridays are a weekly opportunity for the FS and KS1 to consider the natural awe and wonder of outdoors. We have a variety of visits for all of our children including visits to museums, the opera and Finland! We aim to support our children in understanding that the good things in life are a blessing and not a right. We do this through enabling them to appreciate the differences between their experiences and that of other less advantaged children particularly when we are responding to natural disaster or a charity campaign. In society today where there are such rapid changes and developments, we believe it’s challenging to ensure our children appreciate what has enduring value. Giving the children rich and varied experiences with time to reflect helps with this. This frequently happens in our Acts of Collective Worship but may also be part of a lesson. We also believe that tradition enhances the understanding of our children so have many traditions such as regular residential trips, our annual Pancake Race, the Easter Bonnet Parade and Egg Hunt, our regular Church Services , Sports Day and our annual workshop with The Longborough Opera to name but a few. Enabling the children to appreciate that experience and age can bring wisdom is also a challenge but again time and discussion can facilitate this. The open minded, highly skilled adults in school value the opinions of the children and groups such as The School Council can make changes to policies and procedures. With the Christian value of LOVE at its heart, we have an inclusive community built on the Christian values of courage, truth and respect. We engage, excite and enthuse our pupils, valuing each as an individual to be nurtured and enabled to achieve their potential in a safe and happy environment. Great Rollright Primary School is a thriving village school with a warm and friendly atmosphere. Every child is nurtured in a secure and positive learning environment, so that each one is a happy, confident learner. We inspire high self-esteem and aspirations, we recognise the talents of all, we value personal and academic achievement and we celebrate the success of each and every individual. 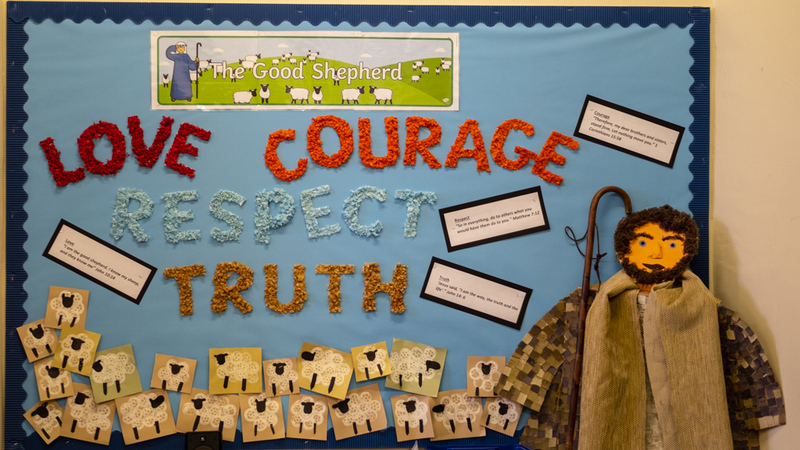 Everything we do at Great Rollright School is rooted in the Christian values of love, courage, truth and respect which ensures we have a strong inclusive community. Keen users of their academic, creative and physical skills. Equipped to appreciate cultural diversity and environmental responsibilities. Able, confident and informed users of media and technology. Educated to be responsible for their personal well-being and to make safe, healthy, informed life choices and moral decisions. Flexible and adaptable to changes in society. Active members of their community. At Great Rollright School we achieve challenging, yet realistic, standards through excellent teaching and active learning. We are constantly reviewing and expanding our high quality provision. We manage our resources effectively, so that the needs of every child can be met. We have high expectations and encourage lifelong learning in all. We believe that good communication is vital to develop the strong partnerships that support the children in our school.